Bookkeeping services lay the basis for monitoring and controlling the performance of any company. Also, bookkeeping is the first step in preparing financial statement and filing tax returns. We take keeping the books serious! Our bookkeeping staff is located in Munich/Germany. Only professionally kept books secure meaningful analysis of corporate data and support purposeful corporate decisions. Based on the accounting data we can also offer the following services: Accounts receivable accounting and analysis, dunning and electronic payment support. 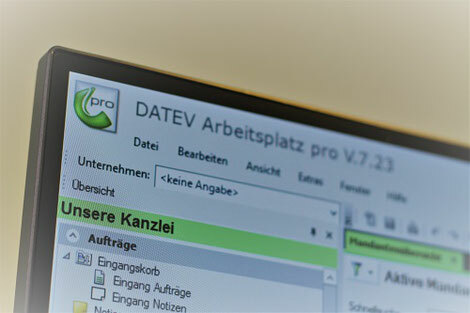 The German standard accounting frameworks - "SKR" - were developed by DATEV, the largest cooperative of German tax adviser in which we are also a member firm. There are several versions of "SKRs", whereas SKR 03 and SKR 04 are the most well-known accounting frameworks in Germany. SKR 03 and SKR 04 are designed for general use and are used to aggregate certain accounts in order to generate the statutory reports, such as the balance sheet and the profit and loss account. SKR 03 and SKR 04 are generally applicable for all industries and company sizes. In addition to SKR 03 and SKR 04, there are a number of SKRs for specific industries. This is due to the industry-specific circumstances which may require a special accountinf framework outside SKR 03 and SKR 04. These include, for example, accounting frameworks established by the respective business associations, such as the wholesale and retail industry accounting framework. But also standard accounting frameworks such as SKR14 for the agriculture and forestry industry or SKR70 for the hotel and catering industry are sector-specific solutions. SKR 03 and SKR 04 are suitable for computerized accounting. Therefore, both SKR 03 and SKR 04 are suitable for start-ups and small businesses. As already mentioned, SKR 03 and SKR 04 can also be used without problems by medium-sized companies. We can also use any accounting framework requested by you. We would, however, need to match your accounts to the accounting frameworks set by the German Commercial Code and the tax office.